A great free app that allows users to investigate and fly through a 3D rendering of the human skeleton. 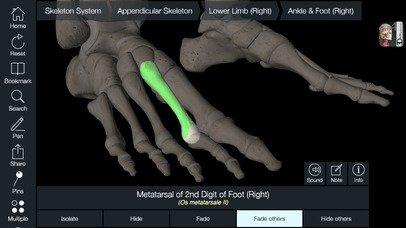 Essential Skeleton is a free iPad app that students studying the human skeletal system should download. The app puts a 3D skeleton on your students’ iPads. Students can zoom-in, zoom-out, and rotate the skeleton 360 degrees. 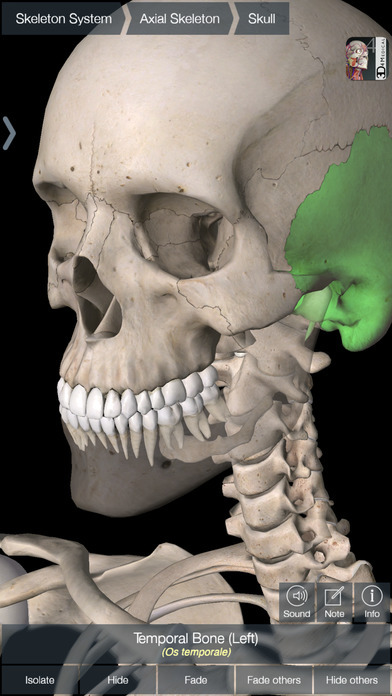 When students zoom-in and tap on a bone they will see its name in English and Latin, have the option to hear an audio pronunciation of the bone’s name, learn about the connected bones, and write their own notes about the highlighted bone. The app opens with a skeleton in what an art historian might call a relaxed orant pose. Through a process of addition by means of menus on the right-hand side of the screen (which can be moved to the left for those who wish), various layers of muscles, arteries, veins, organs, nerves and other elements can be placed on the skeleton. Each can also be removed, and parts of each can also be taken away to focus on discrete subsections. All in all it’s a great app that spans many learning levels from young children where its visual nature helps them understand the bones in their body, to secondary level where there may be a need to learn the individual bones and how they fit together. 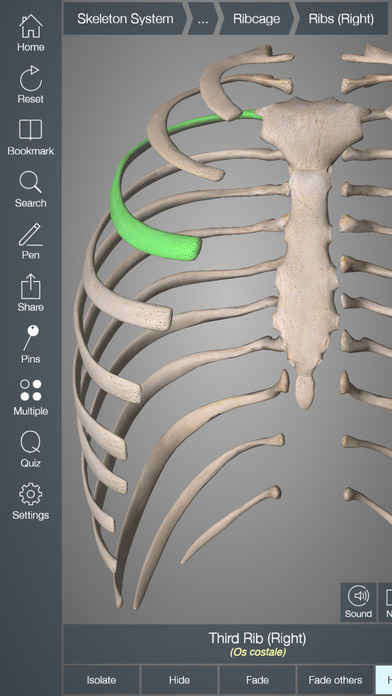 Essential Skeleton 4 is a fully functional, self-contained app covering the essential anatomy of the skeleton. 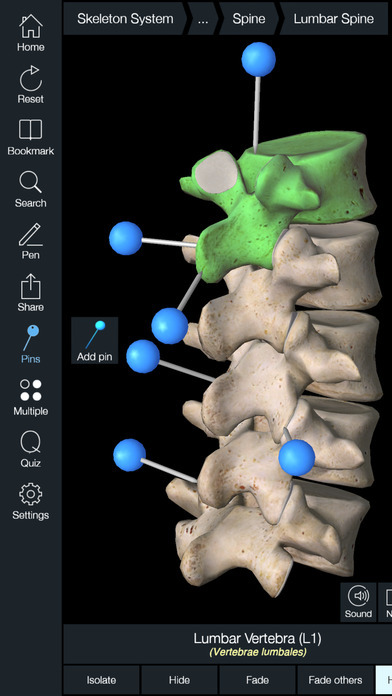 This app is being offered free to demonstrate the groundbreaking 3D technology and innovative design inherent in 3D4Medical's new range of apps. 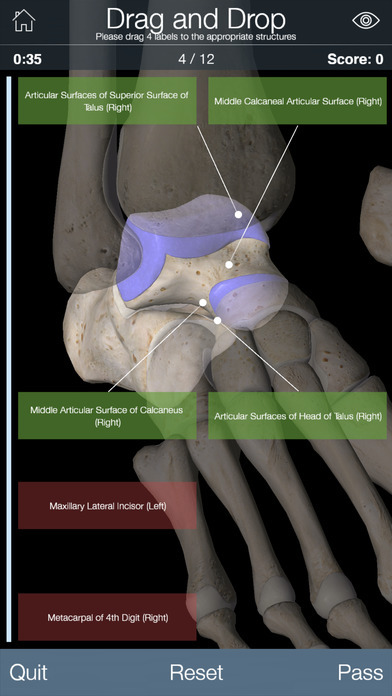 3D4Medical have developed a cutting edge 3D graphics engine designed specifically to maximize what can be done with anatomical models in the mobile and Mac environment. Now 3D4Medical have also created custom built anatomical models which have been built from the ground up specifically for the proprietary 3D Display engine. The result is unparalleled graphics and functionality. It is a stand alone app and does not contain any in-app purchase requirements. We encourage you to download this app, as well as the free version of any competitor's app. Compare and decide for yourself which is better in terms of 3D models, functionality, medical accuracy and ease of use. Afterwards, let us know -- we'd love to hear from you! Essential Skeleton 4 is responsive, visually stunning and effortless. The app is fully 3D, meaning that you can easily manipulate the skeleton and individual bones, as well as view them in isolation from any angle. Our new Multiple Selection Mode allows you to select multiple bones and isolate, hide or fade them. New 3D technology via 3D4Medical's latest graphics engine. Simple navigation and user friendly, intuitive interface. Pin feature: Create customized pins with notes and place anywhere on the 3D model. Correct audio pronunciation, Latin nomenclature and description for each bone. Select areas or the entire skeletal system using the Breadcrumb Trail. Create and save custom views with Bookmarks. Dynamic quiz function - Drag and Drop and Multi-choice. Extensive social media tools and sharing capability.